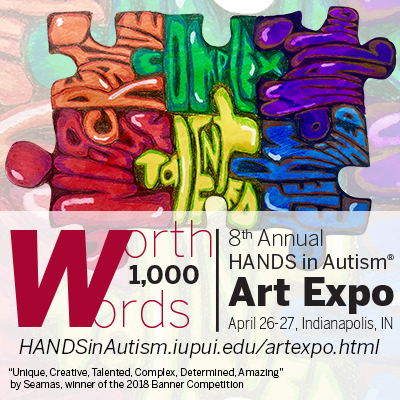 HANDS in Autism® is seeking artists for the 8th Annual HANDS in Autism® Art Expo! This year’s theme is “Worth a Thousand Words”. Artists with ASD are encouraged to submit artwork of any medium to be displayed at the event using the link below, though all artists, classrooms, teams, community groups, and clubs are welcome submit pieces to celebrate autism! Please email hands@iupui.edu with any questions. To enter, go to tinyurl.com/2018ArtExpoSubmission to enter in information and submit photos of the work. All work must be the original creation of the artist(s), but participants may have someone such as a caregiver submit on their behalf.